Sun, Feb 3, 2019, 08:34 pm SL Time, ColomboPage News Desk, Sri Lanka. 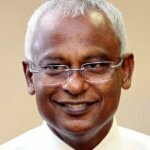 Feb 03, Colombo: The President of the Maldives Ibrahim Mohamed Solih has arrived in Sri Lanka Sunday morning, on a State Visit made on the invitation of the President of Sri Lanka Maithripala Sirisena. 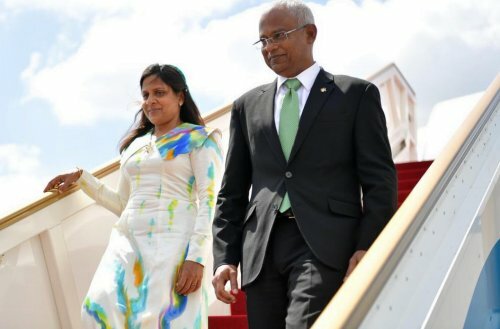 President Solih, accompanied by First Lady Fazna Ahmed and a high level delegation of the Maldives' government and will partake in the 71st Independence Day celebrations of Sri Lanka as the Guest of Honor, President's Office said in a press release. The President, First Lady and the delegation of Maldives government was received at the Airport by Prime Minister Ranil Wickremesinghe. During the three-day visit, President Solih will hold one-to-one deliberations with President Maithripala Sirisena on charting the course for future Maldives-Sri Lanka bilateral ties. An official Welcoming Ceremony will be held at the Presidential Secretariat. President Maithripala Sirisena will host President Solih and First Lady Fazna Ahmed for a State Luncheon.